Christopher Greene was a Colonel in the Continental Army who was the ranking officer at an important victory at Fort Mercer. More notably (but less famously) Greene assembled one of the only integrated regiments in the Continental Army, with black and white soldiers serving side by side under his command. When, in the aftermath of the Battle of Lexington and Concord, the British found themselves trapped in Boston, the call went out to surrounding colonies to send reinforcements. One of the men who led soldiers to help was Rhode Island Assemblyman Christopher Greene. Greene, who had long served in the militia and was one of Rhode Island’s Kentish Guards, was sent to join the Army of Observation. Shortly after the arrival of George Washington, Greene was instructed to take his men and join Benedict Arnold on his long, dangerous trek through Maine in an attempt to lay siege on Quebec. This assault failed and, despite great bravery, Christopher was taken prisoner. After eight months, Christopher Greene was released and soon rejoined the Continental Army. He was promoted to Major in the division which was overseen by his third-cousin Nathaniel Greene. Christopher was given Command of Fort Mercer which overlooked the Delaware river. He was responsible for prohibiting British ships from bring supplies to enemy-held Philadelphia. While in this position, Greene commanded during the Battle of Fort Mercer which, despite lopsided numbers and constant fire from awaiting ships, he was able to beat back the Redcoats. Christopher Greene soon received transfer back to his home State of Rhode Island. Here, he took up the task of recruiting new soldiers to his 1st Rhode Island Regiment. Greene made the controversial move of recruiting black men and slaves to serve. He was able to get the State Legislature to pass a law allowing slaves to receive their freedom in exchange for enlistment (and their owners would be compensated with market value for the financial setback they would receive). Though this would be overturned soon after, those who had already signed up were permitted to continue their service. Under his command several companies were made up entirely of black men, while others were integrated. This regiment would remain together for the remainder of the war, though they did not go south to fight in Yorktown as leaders of the Southern States were nervous about the implication to their own slaves. Colonel Greene led his integrated regiment during the Battle of Rhode Island. Although this engagement was technically a stalemate, his men were applauded by the French officers who had just arrived in America. He then went to Westchester, New York and set up headquarters. Soon thereafter, his men were surrounded at sunrise by Loyalists and attacked. Greene was killed, and his body mutilated. The rumor that they were ‘brutally murdered’ with their bodies dragged a mile into the woods and cut open outraged Americans. This, along with the hanging of Isaac Hayne and the Fort Griswold Massacre, helped muster resentment against the British in the final months of the war. Would you like to read about other Founders who worked against certain racist norms of the day? 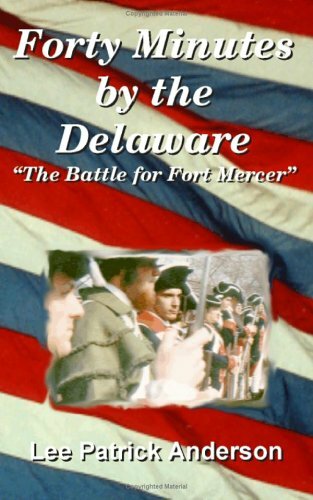 Want to learn more about the Battle of Fort Mercer? We only touched on the subject here, but a whole book has been dedicated to it. ‘Forty Minutes by the Delaware’ covers the battle from start to finish. Pick up a copy through the Amazon affiliate link below (you’ll support this site, but don’t worry, Amazon pays me while your price stays the same).